Disney 'Villainess' number 3!! 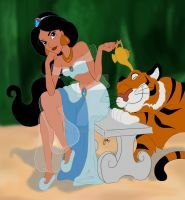 Jasmine/Jafar with her trusty friend Iago/Rajah (or Iajah!). This one took a bit longer than the others, mostly because there are so many characters to color and ink. Yay for glowy scarab beetles!! ^v^Wow! Nice picture! It's totally awesome! In Search for her Mother, Jasmine went Back in Time to Find her, and Changed her Appearance, Gender and Name to get into the Palace. She Bought a Parrot and The Sultan made her the Royal Vizeer....Do you get what became of her? You just combined heroes and villains together!!! This is really cool! Could you do a Mulan/Shan-Yu one please? I was planning it at the time, but I don't know if I have the time right now! OMG! There's the Rare Tiger Parrot! This series is so awesome. I hope I see more. So...this means that jafar must be the (wayyy past his 16th birthday) prince...which means that the street rat must be a girl, (who's trusty sidekick must be abu!) as of yet unnamed? I can't wait to see that. Very awesome! You've made Jasmine rock the Jafar look here, and I absolutely adore Iajah. hahaha, absolutely great idea! I don't remember the bird's name, but he's the most lovely here! Great work! Thanks so much!! Lol I appreciate it very much! This pic is really well done, very original. Mmmmm perhaps!! I'm planning on doing as many heroine/villain crossovers as I can, so Belle and Gaston are definitely on my list. Oooh, I love what you did to Iago/Raja!!! That's awesome! !